Back in 2008, astronomers detected an asteroid heading straight toward Earth. 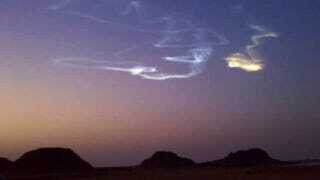 For the first time ever, they tracked the rock as it veered towards our planet and exploded over the Nubian desert. Now, pieces of the recovered meteorite are beginning to reveal its secrets—like how it once harbored an active volcano. One tiny piece of the meteorite, less than an ounce, is the subject of a new study in the journal PNAS about volcanism in the early universe. ALM-A, as it's called, was just one of about 600 pieces recovered from that particular meteorite, but it tells an intriguing story about the universe 4.6 billion years ago. The scientists who got their hands on ALM-A scrutinized it intensely. First, they used optical and electron microscopes to characterize the fine-grained structures of the rock. Then they ground up a tiny piece of ALM-A into powder and analyzed its molecular make-up with mass spectrometry. It turns out ALM-A is rich in silica-containing minerals that only form from rapidly cooling lava. "I would have thought that these kinds of rocks could only have formed much later, on larger bodies like Earth," Addi Bischoffa of the University of Munster told ABC Australia, "But to have this happening on asteroids so early is fantastic." ALM-A and other chemically similar meteorites found on Earth are believed to have once been part of a primitive asteroid called the Ureilite Parent Body. That's the thing that would have been volcanic. Then, at some point, the Ureilite Parent Body collided catastrophically with another object, sending ALM-A and other bits out into space. Eventually, a mixture of gravity and electrostatic charge caused some of those pieces to re-form, along with other fragments, into the asteroid 2008 TC3. When 2008 TC3 came to visit Earth, it shattered again, this time into hundreds of pieces, miles above the surface of the Earth.